Jammu, December 05 (Scoop News)-LAHDC Leh delegation held a meeting with Governor of J&K the day to highlight and reiterate the demand of the people of Ladakh for Union Territory Status for Ladakh region. Pertinent to mention that LAHDC Leh has not diluted the demand for the UT with Legislature for Ladakh region and strive hard till it is achieved. For clarity it would be appropriate to mention that in the “Special Session” of the Hill Development Council convened recently in Leh the House deliberated on the issue threadbare and a censes was reached to reinforce the demand and pass a resolution in order to impress upon the authorities in Central as well as State Govt to take urgent steps to fulfil the demand of setting up of the Union Territory. However, with a view to give impetus to the overall development of the region, creation of a separate Division for Ladakh has become inevitable. 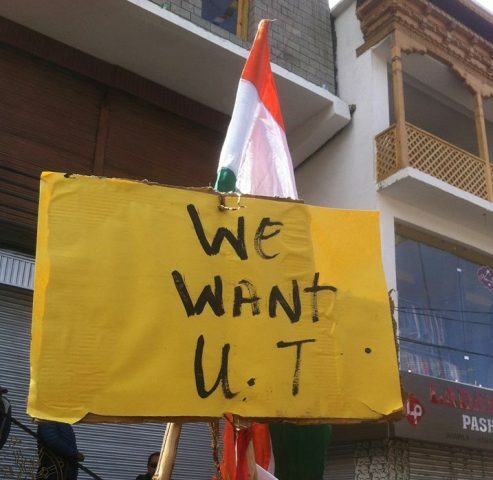 Carving out a separate division for Ladakh would in no case dilute the demand of the people of the region for UT. Ladakh is distinct from Kashmir in all respects culturally, ethnically, linguistically and geographically. Ladakh remains cut off from rest of the country for more than 6 months in a year. Besides Ladakh occupies 70% geographical area of whole of J&K. Ladakh deserves special attention and treatment in infrastructural development as it borders with two unfriendly countries. It will provide space for promotion of its rich language, script and to preserve ,promote the unique art and cultural heritage of Ladakh. Will open more avenues for representations and participation in general. The exploitations and discriminations of Ladakhis will be non existing resulting in moral boosting to the Ladakhis. Besides these people of the region has been continuously demanding for Full fledged Central University in the medical College and Women College. Establishment of a full-fledged Central university In Leh would immensely benefit the students community and would also benefit the economy of the region. During the last visit of Narendra Modi, Prime Minister of India to Leh, his kind attention was drawn to the opening of a Medical College in Leh .He was pleased to apss suitable instructions in this regard. The role played by the district hospital to cater to entire district of Leh is applauded. The patient load has tremendously increased in recent past due to increased tourist in-flow, construction workers fro other parts of the country and patients from other areas also, which has put additional responsibility on the health sector of the Leh district. During the winter months Leh remains cut-off from the other part of the country for more than 6 months and air travel id the only mode of transport available to this region, which makes it impossible for patients to visit other parts of the country for treatment.. The remoteness and inaccessibility of the area makes the hospital eligible for establishment of a medical college.